The Country Catalogue website now features a Dog Walker Clothing & Accessories section, tailored to meet dog's and owner's needs when out and about in the countryside. 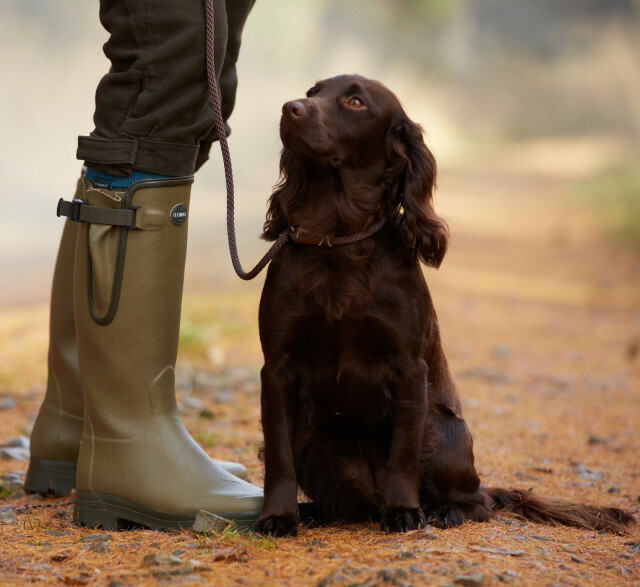 The Country Catalogue stocks a large range of wellingtons and waterproof clothing suitable for all types of budget to help you and your pooch keep warm and dry whilst on a dog walk. As we all know, all dogs need walking and regular exercise. Dependant on breed, some need more than others. For example, most adult Cocker Spaniels would be content with a brisk 30 minute walk in the morning and evening. As a general rule of thumb, a healthy and active Labradors would also require an hour's exercise a day, of course more energetic working Labradors may require an hour and a half or more. Commitment to looking after you and your dog on a walk requires good quality clothing, footwear and dog accessories and The Country Catalogue can provide that for you. Baleno Nottingham Mens Jacket is primarily a shooting jacket, however The Country Catalogue consider it versatile enough to also be perfect for walking your dog in as it is waterproof, windproof and breathable. A detachable hood and adjustable poppers on the cuffs offer additional protection for those days of inclement weather. No excuses not to take your four legged friend out whatever the weather! For the Ladies, you may want to consider Musto Women's Melford Fleece Jacket in flattering "Bordeaux" for dry but chilly weather. Currently at a bargain price of £65 reduced from £100, it would be a shame to miss out on such a brilliant price on a high quality fleece (whilst stocks last). Made from Arctec® 360 fleece the jacket has a scooped hem for warmth and comfort, along with front zip pockets. The front zip pockets would come in very handy for storing dog treats, dog whistles and dog leads! Baleno Kensington Ladies Coat is perfect for combining country style and practicality. Baleno Kensington includes a detachable hood, adjustable poppers on the cuffs and taped seams offering extra protection from inclement weather. Additionally, the longer length of the coat makes the Kensington perfect for dog walking. Flattering shaping at the waist and thoughtful contrast piping ensure a smart and feminine style. If your children join in dog walking duties, be sure to keep them warm with Seeland Eton Kids Jacket which includes a waterproof and breathable SEETEX membrane. For wet weather Bonart Children's Poacher Overtrousers are perfect to keep the little ones clean and dry. An elasticated waist ensures that these overtrousers are comfortable and easier to get on and off; a draw cord allows for extra adjustment if required. Now to talk about prepping your dog(s) for dog walking, The Country Catalogue highly recommends Green Towelling Dry Coat. Available in sizes 12" - 24" (subject to stock), The Country Catalogue's approximate size guide can help you decide what would fit your dog best. When measuring your dog for a coat, it is advised you make the measurement from the back of the neck (just below the collar approximately) to the base of the tail. The Towelling Dry Coat includes a thick belt for added chest cover and adjustable velcro fastenings at the neck and belt to ensure the perfect fit for your pooch! The towelling material is super absorbent and double thickness to ensure your dog keeps warm and dry. The Country Catalogue stocks a range of great quality and value leads, including Basic Slip Lead, Bisley Slip Lead in Yellow and Deluxe Slip Lead in Red or Green. All of our leads are strong and durable.